It’s a depressing thought for parents but the truth is, kids never forget the presents they wanted but never got. We’ve all got memories of those times that, if we were good girls and boys, we masked our disappointment with a grimace and if we were bad boys and girls, we threw a dicky-fit when we didn’t get what we wanted. Much as we’d now like to feel that we’ve thrown off the shackles of consumerism, when we were kids we were shameless consumers and if we wanted something, we wanted it bad. It’s not like it’s the end of the world or anything, but such is the landmark significance of Christmas time that all its memories seem to crystallise and harden over time. None more so than the time when you stared at your as yet unopened main present, realising that, unless the real thing was half the size than you’d imagined, the unveiling was going to be a bit of a let-down. But of course it’s not always that big a deal. Kids are more thoughtful than we sometimes imagine and many keep their ideas to themselves on the understanding that the thing they really want is just bang out of order, Christmas or not. But it’s time to out the guilty secrets. Here are the presents that never were, and never will be. That is, unless we end up buying them for our own kids. And don’t tell me that’s never happened! When was a fake firearm ever an appropriate Christmas gift? There’s nothing more revealing of someone’s age than favourite toys. You can almost pinpoint the exact year of birth with it. I’m almost certain that very few people reading this blog will have any idea what I’m talking about when I mention ‘Johnny Seven OMA’ or ‘Secret Sam’. Both were made by American company Topper Toys and heavily advertised in the 60s. 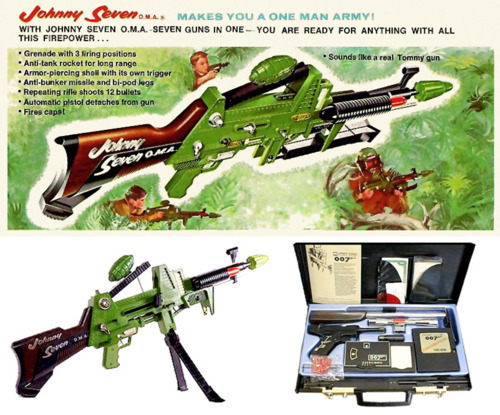 The one I really wanted was the Johnny Seven (OMA stood for ‘One man army’). I knew it was never going to be and I was always cool with that. It was ridiculously expensive and, even then I knew that my only real chance of seeing one, never mind owning one, was to go see my cousin in his posher neighbourhood and hope that one of his mates might have one. It was a big piece of death-dispensing plastic with seven fearsome weapons - a grenade launcher (the best bit), anti-tank rocket, armour-piercing shell, anti-bunker missile, repeating rifle and tommy gun. It’s ridiculous isn’t it but I don’t remember anyone, even my snooty auntie having any qualms about giving a replica weapon as a present, but then nobody seemed to care about the black and white minstrels either. I was absolutely mad about guns and this was the ultimate. In fact, that Christmas I got a rifle that expelled a spent cartridge shell after each pull of the trigger, all of which were lost by Boxing Day, thereafter replaced by something that promptly jammed (have you ever seen a 60s Corgi Batmobile without a stuck match in it?). I liked the rifle, and years later when I eventually battled it out with the only kid I ever knew with a Johnny Seven (by now completely knackered with bits falling off and all but one of the functions rendered inactive) I felt I came out on top with my more robust and realistically scratched wood and die cast metal affair. I know this all makes me look a bit James May, but Christmas is a time for truth and honesty and I suppose I am a bit like the wrong-haired Top Gear boy’s boy in this regard. In fact, I became quite good at making my own slightly sad but functional versions of the toys I really wanted later on. I made a very serviceable Secret Sam/James Bond attaché case with a biscuit tin and a plastic gun cut into bits. My Haunted House made from cereal boxes was not quite as successful though. Not until I had access to a more robust grade of cardboard, did I perfect the stair that the ball went down. Personally, I’ve never had that sinking feeling - I was always chuffed with what I got although I suspect I’ve forgotten most of it and the vast majority will still be landfill somewhere, all too slowly turning back into the oil that made it. Jonathan Ross is hosting the 100 top toys ever on Sunday and I’ll be surprised if Johnny Seven is in there, though it’ll doubtless be littered with glassy-eyed, barely-out-of-their-teens pundits reminiscing about 80s TV tie-in bits of inanimate plastic with the same nostalgia. I can’t really remember the year, but I was young – primary school age – so it was probably early 80’s. There was this new rage – Roller-skating. Each Sunday morning you could go to the local sports centre and race round and round the indoor hall to extremely loud music. The local Youth Club did the same on Friday nights. I found it really exhilarating! Christmas was coming. All I could think of was getting some brand new shiny roller-skates. I’d seen some. They were red suede with blue strips. Very flashy but with a flashy price tag too. I wasn’t worried. I was convinced that Santa would bring them – well if you wished hard enough, he delivered – or so I thought. Christmas morning arrived and there I was racing down the stairs expecting so see a big box containing new skates. I was so excited. And there, in front of me, was a gleaming brand new bike! 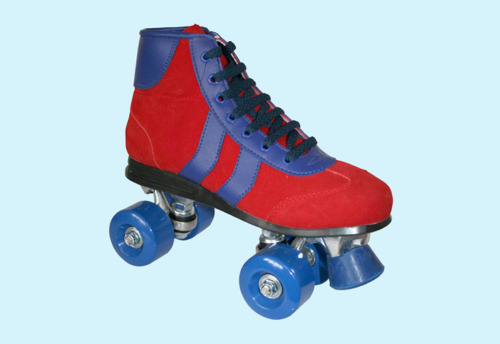 I did like my bike and have many happy memories of riding it but I was really disappointed about my roller-skates. I did get them eventually – February is my birthday, so I didn’t have long to wait. Is it OK to like Barbie? I remember thinking how cool it would be to have a house of my own to decorate, hold cocktail parties, practice in my Barbie band and hide the affair between Ken and Cindy. Scandalous! Anyway, growing up my family didn’t have masses of cash, we were never spoilt kids and were always sporting the latest knock-offs, no matter how much we protested. I was the product of two older sister’s hand-me-downs so I don’t even think I owned new clothes unless it was an ill-fitting gift from one of my close relatives... I won’t say who. My parents were always quite honest with us at Christmas, managing expectations I suppose. Each year they would say, Santa has told us that you have a £30 budget this year for your main gift, which I always thought was a huge amount of money but it was never enough for the Dream House. I instead chose things like Dream Phone (another love of mine) lots of crafty objects, pogo sticks etc. but I still felt that slight resentment when I’d go to my friends’ houses and they would have the Dream House, Horse Box, Convertible etc. Looking back I feel guilty about that, the resentment that is, as I know how hard my parents worked even for the £30. So after years of finger crossing, letters to Santa and even knelt prayers to Santa (as God and Santa must have used the same communications techniques living in the sky, I never believed he lived in the North Pole) I decided to make my own. Using old shoe boxes, lots of tape, some colouring pencils and paper, my Nan’s sewing machine (supervised) and scraps of material, I made the best house in the world. It had 3 bedrooms (two more than Barbie) a living room and kitchen, a fashion studio in the loft and a garden and pool. I even made a path that would unwind out of the front door like a red carpet. It was fab! I used to go up to the attic (which my parents had converted into a playroom) and design new labels for Barbie and her friends, mess about with fairy lights for their weekly disco and generally while away the hours in my fragile cardboard and parcel tape home. That was until mice got into the attic and decided it would be the perfect place to nest. In the space of one evening they had shredded the walls, defecated all over the kitchen (in all fairness I didn’t design a bathroom) and had kidnapped Paul? I’m still not sure how. Even now when I see a Barbie Dream house I feel that yearning sensation I felt as a child. Is 25 too old to own a doll’s house? Not if I don’t play with it right? Every 6 year old boy loves cars, it’s just a given. I would however, describe my relationship with motor vehicles as more of an obsession. 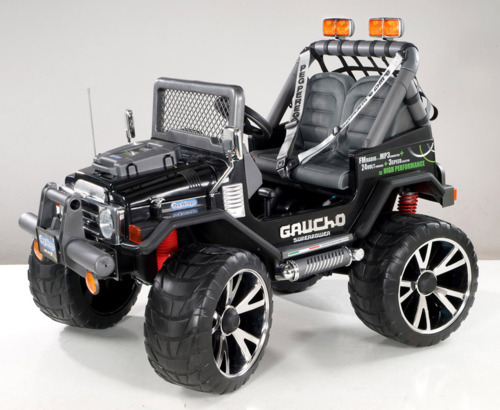 The present that I and my younger brother were both desperate for when we were younger was an electric powered Jeep. I seem to remember the idea came after visiting a friend’s house and us both getting to ride around in one – at 6 years old it doesn’t get much better than that. We were sold. My parents however, were not. This ‘Toy’ was of course ridiculously expensive, and quite rightly we never got one, I think my parents saw that realistically it would be an expensive toy that would be used until... well, at least the end of January. We continued to ask for one for the following couple of Christmas until the point that we got bored, but I’m glad we never got it. It would have been a waste of money, and yes, we would have gotten bored very quickly and it made the times we got to play on our friend’s Jeep all the more special. 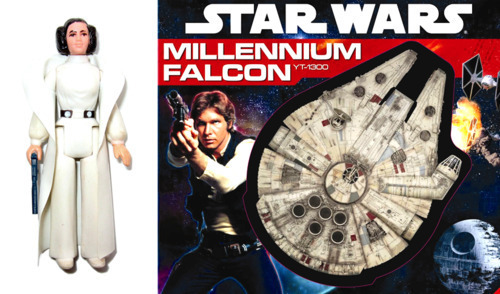 I always dreamed of getting Princess Leia and the Millennium Falcon for Christmas, yet it was not to be. Christmas day came and I anxiously unwrapped the odd-shaped package, discovering several ‘My Little Ponies’ and a stable for them - my brother got the Falcon. True gender stereotyping by our parents in the early 80s. The worst part of the whole experience was the sheer lack of sharing between siblings, so not only did I not get to play with it, I had to watch him spend hours having fun. In 1974, I was 10 and fanatical about football. Still am too! I could just about remember the majesty of the greatest World Cup that has ever been, in Mexico in 1970. Brazil had taken Italy to the cleaners in the final and everyone was trying desperately to recreate that Carlos Alberto goal in our tenfoot in the suburbs of West Hull. Roll on 4 years and our desperation levels were acute as the German World Cup rolled agonisingly towards us, and we counted down the days. The final was in the space age stadium in Munich and that was my first real exposure to the wonderful world of brand. Being in Germany, Adidas and Puma took control of proceedings. But for me all the finest players in the world donned the famous 3 stripes and took us through their most lavish moves. Whether it was Cruyff and his infamous reverse step-over or Gerd Muller’s goal-poaching of the highest order, our small town backyard was agog with obsession and all things Adidas. So when it came to Christmas 1974, there was only one thing on my mind. I needed, yes absolutely needed, a pair of Adidas Samba trainers to impress the Thornwick Avenue gang that I had the right look to deliver the moves and talk the talk. The black leather, suction soled, trainer with its famous 3 white stripes was the pinnacle of footwear as far as I was concerned, and a must have on my Christmas list. The major barrier to success though was my Dad, Alec. He was a hard working, self-made man, many of whose values I am now ironically delighted to have inherited. As far as he was concerned though, you could buy a perfectly good pair of trainers in Myers, an electrical shop in Hull that also strangely sold footwear, for a quarter of the price of these branded shoes. He may well have known the owners of Myers, for he was adamant that their finest at £10 were easily a match for these posh trainers that I had specified, which then came in at the princely sum of £40. No matter how hard I negotiated or called on Mum to intervene, he was not to be moved, and out popped the embarrassing Myers pair on Christmas morning. My disappointment was abject. I managed to make my existing trainers last another 6 months until they literally fell apart, and all to avoid having to wear the embarrassing trainers that he had insisted on. Looking back, I would probably think in much the same way now, especially now that I am a Dad too. But the world has changed and brands have taken over. 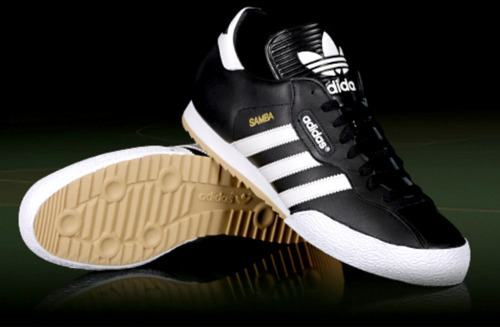 Ironically, the Adidas Samba is still available and has gone on to be their second best seller ever (after the Sam Smith). I see lads, old and young, wearing the famous footwear and often thing back to the Christmas present for me that never was. And guess what. How much do you think a pair costs on Amazon today? £33.95 with free delivery! Funny that….